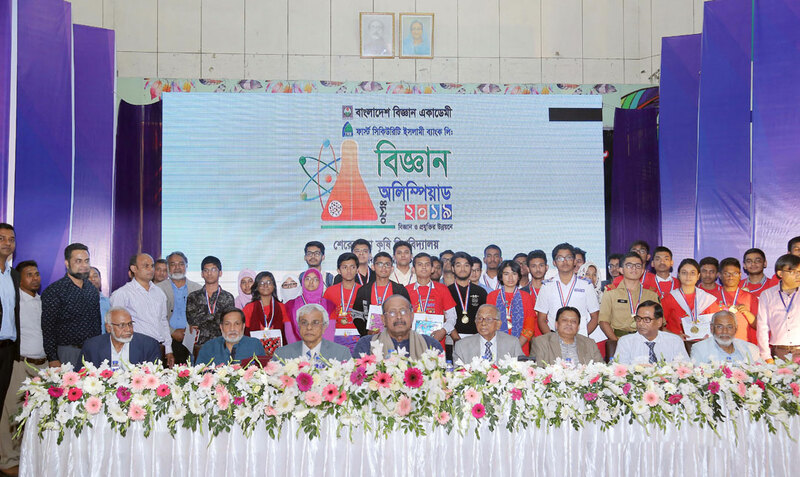 The Closing Ceremony of Bangladesh Science Academy-First Security Islami Bank 10th National Science Olympiad-2019 held at Sher-e-Bangla Agricultural University on 8th March, 2019. Architect Yeafesh Osman, Honorable Minister, Ministry of Science & Technology, Government of People’s Republic of Bangladesh was present as chief guest on the prize giving ceremony. Professor Dr. Kamal Uddin Ahamed, Vice-Chancellor of Sher-e-Bangla Agricultural University, Dhaka and Mr. Abdul Aziz, Additional Managing Director, First Security Islami Bank Ltd. were present as special guest. The program was presided over by Professor Dr. Quazi Abdul Fattah, Fellow & President, Bangladesh Academy of Science. Among others, Professor Dr. Nayem Chowdhury, Coordinator, Science Olympiad 2019, Professor Mesbahuddin Ahmed, Secretary, Bangladesh Academy of Science, Representatives of Media Partners of the program and other officials were present on the program.